Those of you who follow me on Twitter might remember talking about -- OK, if I'm being honest here, complaining about -- a Tinkerbell quilt that I had agreed to make earlier this Fall. You see, my wife's aunt asked for my help in making a quilt to be auctioned off for a function at her church. 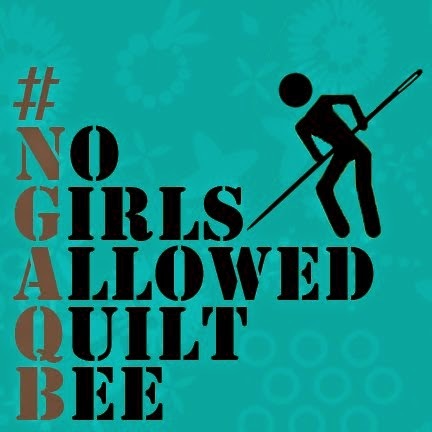 And I wasn't complaining at all about agreeing to make the quilt (after all, I think I've proven my willingness to make things to help others, especially of late! ), but moreso that the request was very prescriptive. 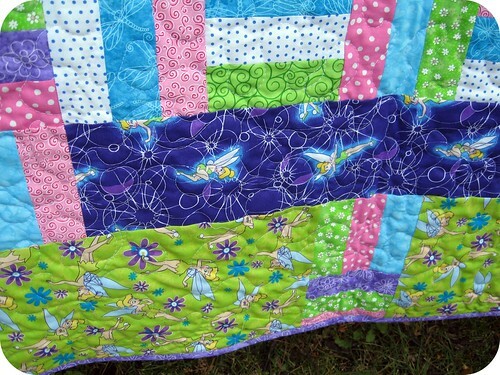 The quilt had to feature a Tinkerbell panel, which was the only piece of material provided, so that it could coordinate with some pillows and other items that some of the other church members were making. Tinkerbell? SO not my usual style. But I have two young daughters and consider myself fairly attuned to what they like, so I forged ahead. I headed over to my local Jo-Ann fabric store to purchase all of the coordinating fabrics for the project. I quickly found two other Tinkerbell prints that matched the panel and had a small amount of them cut, but didn't want this quilt to be too over the top with the licensed characters. So I took the panel to the great big fabric wall and started pulling some other prints. I should have known that this is where the project would start to become fun for me. Pulling different prints and colors and combining them together is always my favorite part of the process. I took my cue less from the Tinkerbell character and more from the border of flowers that surrounded the panel. With garden imagery in mind, I found some purple and blue prints that featured flowers, dragonflies, and butterflies. I also selected some smaller scale prints like swirls and dots in shades of pink and green. Overall, I loved how the wide variety of prints was eclectic yet coordinated, without seeming too matchy-matchy. I actually have to credit my daughter Megan, a budding quilt designer, with finding this perfect backing fabric. She was with me on the shopping trip and, while I was finding some of the other fabrics, her little voice asked me "what about this one?" It reminded me of a vintage sheet, and I thought it was perfect for this back of this twin-sized bed quilt. To this day, she is still so proud that she found this fabric! I made up the pattern as I went along, basically beginning with strip-pieced rail fence blocks and improvising some borders around them. The only tricky part was calculating the size of the blocks, since I had to base the whole design around the panel and it was (of course) not a standard size. So after a bit of early complaining, I have to say that I really enjoyed this project. Although it's not really "my style", I enjoyed the challenge of the fabric selection and pattern design. I loved seeing it through my daughters' eyes, who oooh'd and ahhh'd the whole time I was making it. And, of course, I'm satisfied thinking abou the little girl whose mom or grandma (or dad!) brought this home to her from their church auction. And the silver lining of the whole experience? I entered this quilt in Jo-Ann's Quilt Your Colors contest, which is open to any quilt made from fabrics purchased at Jo-Ann stores. I don't have too much hope in winning anything -- Jo-Ann carries much nicer fabrics than the ones I selected for this project, and I am sure there are some people out there making amazing things -- but it's exciting to think that I might be in the running! John, for something that is "not your style," you pulled it opff pretty well. Just think of the little girl that is going to just LOVE this! What a pretty quilt! When I saw it I thought, "Something about this quilt looks familiar". I realized that in the past, I've had all the fabrics you used in your blocks. What are the odds? 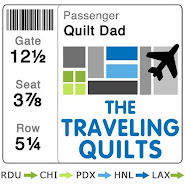 By the way, since your daughter was drooling over the quilt, did you make one for her? Just wondered. She did a great job picking out the backing, she has a good eye for coordinating. 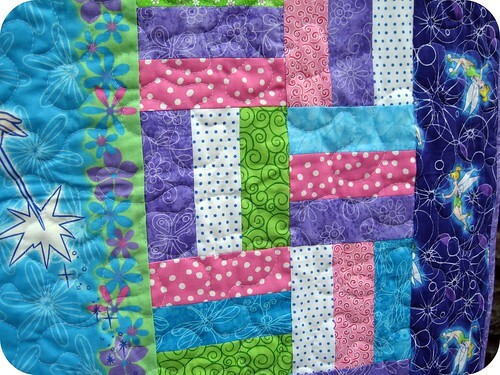 How about letting your daughter pick out fabric for a quilt and see what you both come up with in terms of color/design? Oh that is really adorable. Some little girl is going to be super happy with that one! 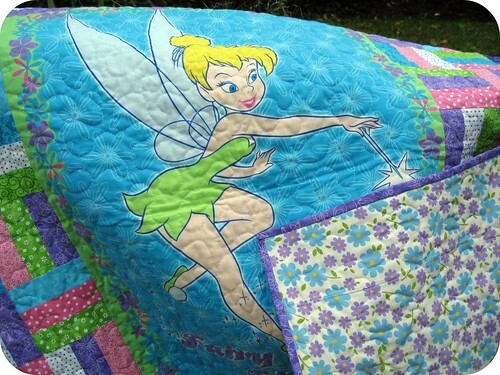 I'm not big on Tinkerbell either, but I have a 13 yo daughter and a 4 yo daughter who would either one LOVE to have this quilt! Great job... and I too love that backing fabric! I can see that you're not a Tinkerbell kind of guy, but it is truly prescious! You'll make the day for some little girl! Absolutely lovely for a "not your thing" quilt!! You have given a little girl the bestest present. I agree with Carol, let Megan pick out a bunch of fabrics, and maybe the pattern, and see what you two can come up with. It should be wonderful. I love the backing fabric, I can see using that one a lot ... good eye she has! I find sometimes the joy comes in taking something very different and out of my comfort zone and making it "mine" ... which it sounds like you've done here. Congrats to you! I think the colors your choose were perfect! Good job on a project you weren't too thrilled with in the first place. Glad your heart and soul came around and you were in touch with the whole quilt in the end. OMGoodness! your work is fabulous!! love what i am seeing here... a new follower have you! What a job - I can see why she wanted you to make a quilt. 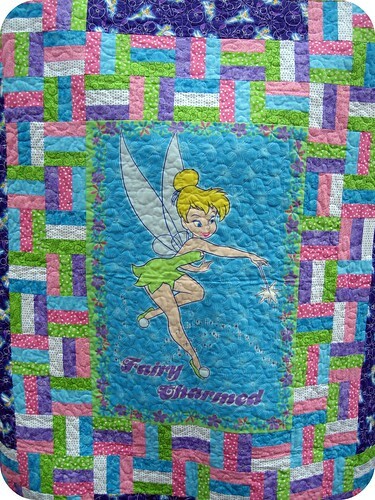 A very sweet quilt some little girl will just love. I applaud you for working outside your usual and doing so well. I made way too many quilts like this in the last year - theme quilts with color palettes and patterns completely opposite of what I would pick. But I think it's a good test in patience while using a different set of creative brainwaves. 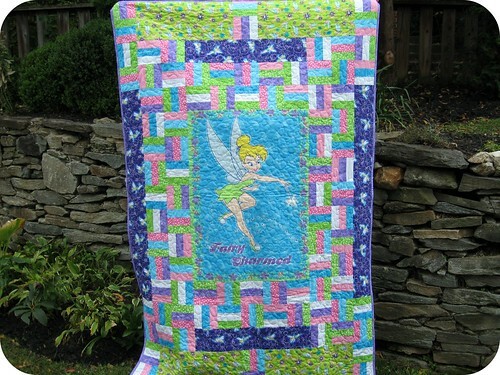 Your Tinkerbell quilt is adorable and perfect for any fairy-loving little girl! Having raised two little girls who once thought of themselves as fairy princesses, I know that some little girl will be sleeping very happily under your quilt. The prince charming side of daddy definitely came out making this quilt.